From the acclaimed author of Creep and Freak whom #1 bestselling author Jeffery Deaver praised as a “top-of-the-line thriller writer,” a high-octane novel about lethal secrets that refuse to die—until they kill again. Settling back into his childhood home and doing some renovations in the backyard to make the house feel like his own, Matt, a young up-and-coming chef and restaurateur, stumbles upon a locked crate he’s never seen before. Curious, he picks the padlock and makes a discovery so gruesome it will forever haunt him… Faced with this deep, dark family secret, Matt must decide whether to keep what he knows buried in the past, go to the police, or take matters into his own hands. “A tense, suspenseful, thoroughly creepy thriller” (Booklist), The Butcher will keep you guessing until the bitter, bloody end. Don’t miss this “thrill ride that will have your attention from start to finish” (Suspense Magazine). "Once I got started I couldn’t stop reading, and I confess to having sweaty palms a few times. A thrill ride that will have your attention from start to finish! This one is 4.5 stars." "The Butcher is a clever, twisted thriller about genetics, faith, and death . . . 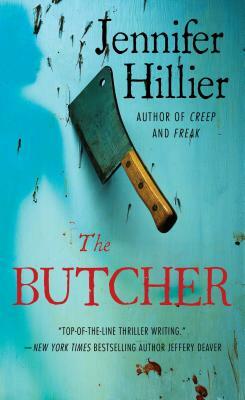 The greatest thing about The Butcher is its uncanny ability to trump the narrative conventions of the conventional serial killer novel over and over again . . Jennifer Hillier's prose remains fast paced and immensely readable as her content becomes quirkier and more cerebral with every novel." "[A] rapid-fire thriller of dark, unsettling proportions with some very surprising twists. With the turn of each new page, the suspenseful plot is tense and gripping...a skillfully penned tale of murder and cover-up that will keep readers enthralled until the powerful finish. Thriller fans should not miss The Butcher!